Halden is from Pinehurst, NC and participated in the China Summer 2018 program. Hello everyone! 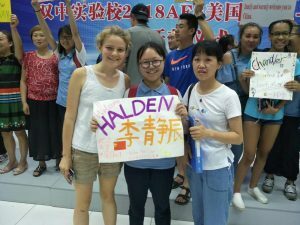 My Chinese name is Li Jingchen, and my English name is Halden Levin. This summer I went to Chengdu, China as a Mandarin Chinese NSLI-Y student. At the Experimental School of SMS, I studied Chinese for six weeks. Before this summer, I learned Chinese online for two years, but I think learning Chinese online is really hard because there’s no face-to-face Chinese teacher. Before going to China, I felt a little nervous because I knew my speaking was slow, listening skills were very poor, ability to recognize characters wasn’t the best, and I also felt writing was a bit too hard! What should I do? On the first day in Chengdu, I met my host sister and host mom. At the opening ceremony when my host sister, named Wu Can, gave a speech I started to cry happy tears because she made me feel welcome. After the opening ceremony, Wu Can and I went to a small convenient store in front of the school to purchase ice cream. Although I told her I was full, she insisted I needed to try Chinese ice cream. When I ate a milk popsicle, I smiled and said, “Very delicious!” By that time, I was not only extremely full, but also extremely happy. After a few days, as they started to get to know me, I told my host family, “I am a very weird American because I love to run, I don’t eat beef or pork, every day I eat too many vegetables and fruit, etc.” Every day they let me run. From Monday to Friday, I often ran at the school’s playground. On the weekends, I ran at their apartment community. As a matter of fact, one day my host dad ran with me, and my host sister ran a few days with me too. 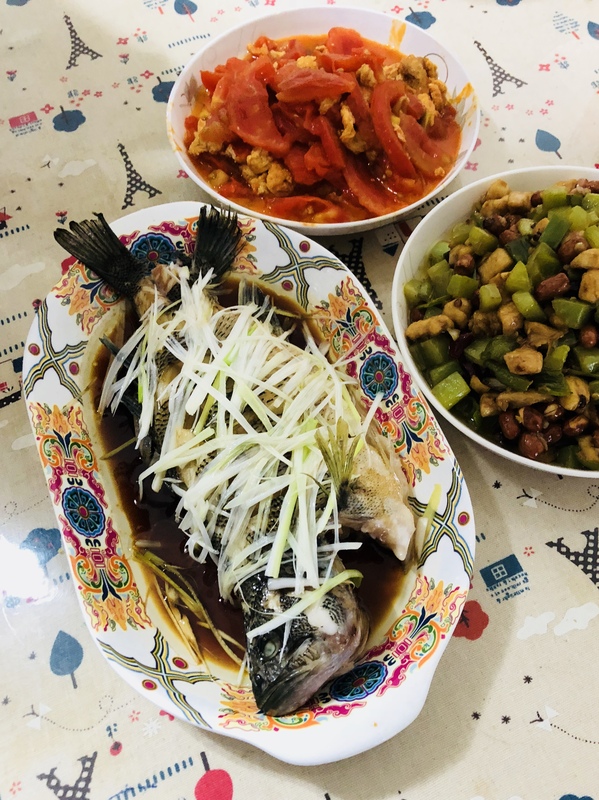 In addition, my host mom made delicious food every day, such as stir-fried egg and tomato, wood ear mushrooms, vegetables in broth, chicken legs, and pumpkin squash. After returning home, she often gave me fruit. My favorites were lychee, pears, plums, watermelon, apples, and peaches. On the first day I went to Chinese class, Wu Can’s classmates told me I looked very beautiful, but I thought I looked weird because I have blonde, curly hair, and my eyes are blue. I stuck out like a camel in a flock of sheep. Many people in China stared at my weird appearance. Some people wanted to take a picture with me, and some wanted me to teach their children English. When I arrived back in America, I thought everyone looked very weird because many people in China look very similar: black hair, dark eyes, white skin. My favorite day was July 31st because my host mom and I spent a long time walking and talking together. We went to a shopping mall together and walked on every floor. We didn’t buy things, only chatted. 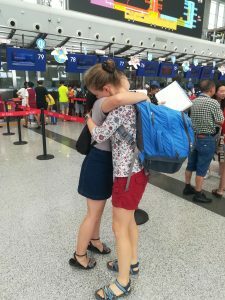 Because of this experience, I started to become more familiar with my host mom, and she also started to become more familiar with me. I learned that Chinese people grow bananas in China; I thought this was very interesting. Additionally, I learned my host mom likes hot weather because hot places have lots and lots of fruit. On the last day, I woke up very early because my host family was going to take me to the Shuangliu Airport. My host mom had to go to work, so she couldn’t go to send me off. At their home, m y host mom gave me a big hug. We started to shed tears. I didn’t know what to say, so I only said thank you. After running, my host dad and Wu Can took me to the Shuangliu Airport. When we arrived at the airport, I saw all of my friends. I didn’t want to cry, but I started to cry again. Many people cried because we knew it could be a long time before we’d be together. I will forever remember them. I wanted to express some of my favorite memories in Chinese to the best of my abilities. A special thanks goes out to my wonderful Chinese teacher, 湖老师, who helped fix some of my errors. Here are a few more thoughts and reflections from my experience in China I would like to share with you. There are some characteristics that define you as a person across languages and cultures. For over three years, I’ve been an avid runner, running in snow and in rain and in pain and in China, and overtime, I’ve realized how running allows me to connect almost instantaneously with new people I meet. A few years ago, I went to Sen Lin Hu, the Concordia Chinese Language Village in Minnesota, and there I met a man named Binga, a man with the body of a runner and the mind of an artist. His accent and my less than standard Chinese skills made communication between us, at least in Chinese, very difficult. 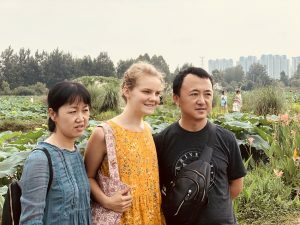 However, early every morning, I would wake up and run down the dirt road to the outskirts of the village and back, and almost every morning, I would see him too, and occasionally he would look at me and say “很厉害！” Every time, I couldn’t help but smile; I felt as if he knew me and I knew him in a way words could not describe. On the NSLI-Y program, in China, I carried this part of me along with, continuing to run. Though my host family lived forty to fifty minutes from my host sister’s and my school, every weekday, they would drive my host sister and I there an hour before classes started. Immediately, I would drop my backpack off upstairs in one of the classrooms and then would run down the stairs and onto the track. Rain or shine (风无雨足) , I would run upwards of twenty laps around the track, and every day, my host parents gave me hard boiled eggs and a banana for a snack. My rather immense love of running again became one of my defining characteristics. When other students on the program saw me run, they would often encourage me onward. A few times, girls from the school hosting us ran with me. When talking to others, my host parents would talk about my running addiction, seeming almost proud as if they were my parents by blood. Even the principal asked me how far I was running. In going to a foreign country, never forget who you are and what defines you as a person. Consider who you are in America and how you can extend those parts of you in other countries because those characteristics and passions help you form relationships and connections where language barriers otherwise inhibit. In every single country, you will find people who love music, who love drawing, who love sports, and practically any sort of thing you can love. Be that crazy runner, that phenomenal artist, that spectacular singer; be whoever you are in your full capacity. I am not a fashion model. I am not drop dead gorgeous. If the weather is humid, which it often is in the Sichuan province, my hair gets quite frizzy. Considering I run quite a bit, I often smell salty from the copious amount of sweat I excrete. All this is to say, I found it rather odd when strangers would come up to me and tell me I was beautiful. Flattered and startled, I would often turn red, say thank you, smile, and move on. On one of the first days in China, we were at the Great Wall of China, and a random man came up to me, and in broken English, asked to take a picture with me. Odd as it was, I said yes, or at least nodded, and afterwards, he told me I was beautiful. This wasn’t an isolated occurrence, it happened again with another man and a few times with some younger girls and also with some Chinese students. I even received small presents for being… well…me? At Tiananmen Square, an older man, who was face timing his parents, came up to me and asked me to tell them hello. I think people took interest in me because, in China, I was an anomaly with my blue eyes and blonde-ish, curly hair. I stuck out like a camel in a flock of sheep (羊群里头出骆驼). Fitting in was simply not an option. The diversity of people in America is so different from that in China. This isn’t to say that China isn’t a diverse nation, it is, but the diversity that exists in China is of a whole different type. For one thing, the diversity of dialects in China is rather intimidating. When I began learning Chinese, I had originally believed that the only derivations were Mandarin and Cantonese, but in going to China, I’ve realized it’s not that simple. The many variations of the Chinese language form an entire branch, the Sinitic branch, of the Sino-Tibetan language family and can be broken down into hundreds of dialects. In the Sichuan province, I realized pretty quickly that many people I encountered weren’t speaking Mandarin Chinese. In regards to ethnic diversity, though the Han Chinese are the dominant ethnic group, comprising over 90% of the Chinese population, there are 55 other recognized ethnic groups in China. On the outside, though China may appear homogenous, linguistic and ethnic diversity does prominently exist. Being in China, I of course tried a whole lot of Chinese food, but I found that I fell back on one of my favorites: vegetables. From the time I was in the single digits, I would crave broccoli and happily munch on carrots. Yes, I was that kind of kid. It wasn’t until I went to China that I realized there was a whole different world of vegetables I had never discovered before: lotus root, wood ear mushrooms, Chinese cabbage, kelp, seaweed, more mushroom varieties, bitter squash, pumpkin-like squash, and the list goes on and on. Overtime, my host mom started to cook my favorite vegetables every night in the form of papa cai, a regional dish which is simply lightly salted vegetables in broth, and would nudge the bowl towards me, knowing that I would keep coming back for more. Whenever we had hot pot, a Sichuan specialty that is a bit like Chinese fondue, my host parents would order tons and tons of mushrooms, cabbage, lotus root, and pretty much any and every vegetable they had available, and after I had finished eating my weight in vegetables, they’d always ask if I wanted more. Starvation was never an issue because my host family would always make sure that I had had enough or more than enough. All this is to say, an important key to having your needs and wants addressed is to communicate. Be reasonable, but don’t be afraid to ask. If you love vegetables, don’t be afraid to ask for more vegetables because, chances are, your host family will listen to you. Additionally, don’t worry about a lack of food because they’ll likely keep feeding you until you say otherwise.